At some point during your implementation of an ISO 9001 Quality Management System (QMS), it will be necessary to write some QMS policies and procedures. While it is useful and important to make sure you don’t have too much documentation, there are definitely some policies and procedures that need to write down to avoid non-compliance. For this reason, it is necessary to have a standard way in your organization to write these ISO 9001:2015 documents in a way that is consistent and easy to understand. 1. Decide on the process limits. After deciding that a process needs to be documented in ISO 9001:2015 procedures, you first need to know the limits of the process you are documenting. Knowing the limits of the process will help you to know when to stop documenting. There are different ways to view a process, but making sure you understand the whole process is important to ensure that nothing is missed, even if you don’t need to document everything. Regardless of how you choose to observe the process, be sure to observe all aspects of the process when gathering information for ISO 9001 documentation. 3. Align with other documents & processes. Aligning with other processes is very important, and making these interactions work well is one of the best ways to make the whole system more efficient. One place to focus your attention is the inputs and outputs of the process. For the inputs, does the process that creates the input know the requirements of the process using it, or might they change the input later? For the process output, is it used somewhere as an input? If not, then you need to question if this output is actually necessary. 4. Define your document structure. There are many different ways to document a procedure. For example, you can choose to have documentation that is a series of paragraphs, or you can choose to have a procedure that is in a flowchart format. Regardless, many companies have a standard document structure to help people know where to look for certain important pieces of information, such as the applicability of the document. Knowing where to look for the information needed can save employees time and improve the efficiency of the QMS documentation. Take what you have found and write enough detail that competent people reading it can perform the job required without causing non-conformances. This is the reason you have a document. Adding unnecessary information will not only make your ISO 9001:205 document more cumbersome, it could also confuse your audience. 6. Get approval for your document. In all cases, you need to make sure the right people approve a document for use. This could be the production manager for production procedures or the purchasing manager for purchasing procedures. A good QMS will define who need to approve which documents so that the right experts are ensuring that the procedure is correct. 7. Train the relevant employees. It is best to find some way to make sure that the people who need to use a procedure have not only read it, but also understand and have implemented any changes into the process. This can be done through audits or even questioning employees to make sure they understand the important parts of a procedure. In this way, it is also possible to verify the effectiveness of the documented procedure to verify if it is necessary to make some improvements. ISO 9001 defines the requirements for Quality Management System. 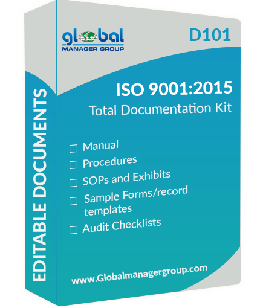 ISO 9001 can be used by any organization – large or small, whatever their field of activity. 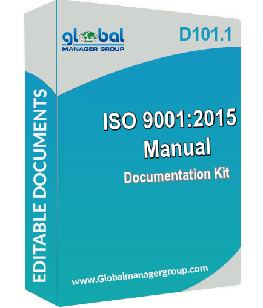 The revised ISO 9001 is published in September 2015 as ISO 9001: 2015. Revised QMS 9001: 2015 standard is based on a number of quality management principles including a strong focus on customers, motivation and involvement of top management, the process approach and continual improvement. Earlier versions of the ISO 9001 standard were very prescriptive, with many requirements and procedures documented records. In the 2000 edition and 2008, ISO 9001 focuses more on process management and less on documentation but now in the latest version of ISO 9001, is less prescriptive than its predecessor, focusing on QMS 9001:2015 documented information and performance for more quality assurance. ISO 9001:2015 Certification has major changes in earlier version for effective Quality management system as follows. Structure -This new structure will allow organizations to implement multiple Integrated management systems such as ISO 14001: 2015, EQHSMS with 14001 and OHS etc. The process approach from the 2000 and 2008 versions of ISO 9001 has been maintained in the ISO 9001: 2015. Introduction of thought based on risk throughout the norm – the term “preventive action” was removed. The entire series is focused on preventing bad things from happening and to look for ways to leverage new opportunities such as new technologies. Leadership: The ISO 9001:2015 certification imposes requirements on top management demonstrate their commitment to the QMS by taking responsibility for the effectiveness of the QMS, establishing policies, objectives and promoting continuous improvement. Planning: When planning the QMS, the organization will need to consider internal and external issues and the needs and expectations of stakeholders. Support: The organization shall determine and provide the necessary resources to establish, implement, maintain and continually improve the QMS. Operation: In this context OMS 9001 deals with the implementation of plans and processes that allow the organization to meet their quality policy and quality objectives. Performance evaluation: This sublime clause all the requirements of monitoring and measurement related to the performance and efficiency of their QMS quality. Improvement: The organization must identify improvement opportunities to continuously improve quality management system of the body. Preparation of committee, that has basic knowledge before implementation. Provide training for employees interested / registered. QMS 9001:2015 documentation as per system requirements. Implementation of the QMS 9001:2015. Conduct internal audits at regular intervals. Then fill – in the record. Work continuously to improve quality.